I spent last week in Santo Domingo, within the Dominican Republic. My job has an office there and this was my very first visit. Lucky you you, I took a photo of everything I ate. And now, we get to talk about it all. Woo-Hoo. Let the DR Reviews begin! We arrived on Sunday, late in the afternoon. We ended up at a restaurant called Adrian Tropical, located right on the coast. The seating was outside and the view was quite lovely. As for me, my future would be Camarones. 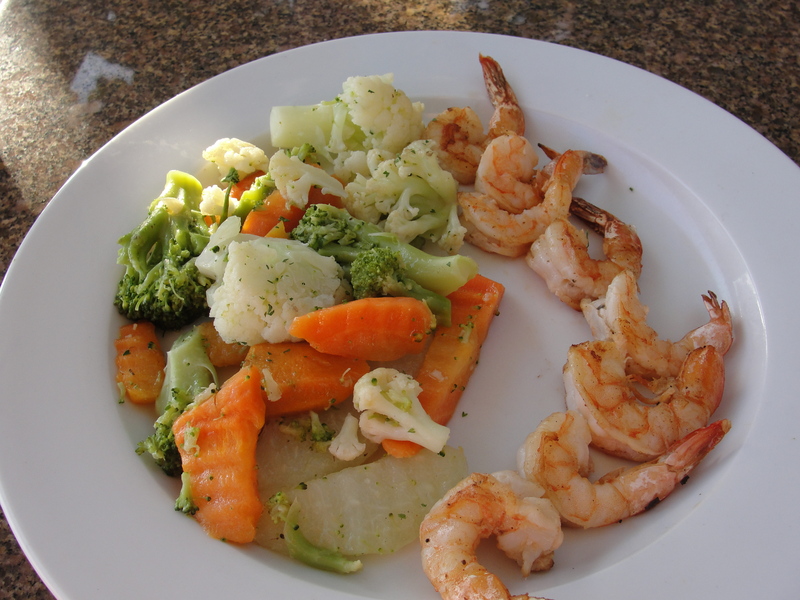 After reviewing the menu, I opted on the Tropical Shrimp and Vegetables. As with everything, the menu is primarily in Spanish. The English version is a bit rusty and provides no explanation of the items. I made sure I stated multiple times that I wished for my shrimp to be grilled. After a longer than typical wait, our food began to come up. The bad thing was that we all got our food at a different time. There were 4 of us and it was a bit of a pain with items coming out. At first glance, my food looked good. The amount of shrimp was a little on the cheap side but, I received not only the vegetables on my plate but also an extra side dish of vegetables. First off, the shrimp was grilled and lightly buttered. I found the flavor to be pretty simple and there was no fishy aftertaste. The shrimp were cooked perfectly and I did not feel as if any of them were rubbery. My only complaint is that the shrimp weren’t too big and there weren’t too many of them. 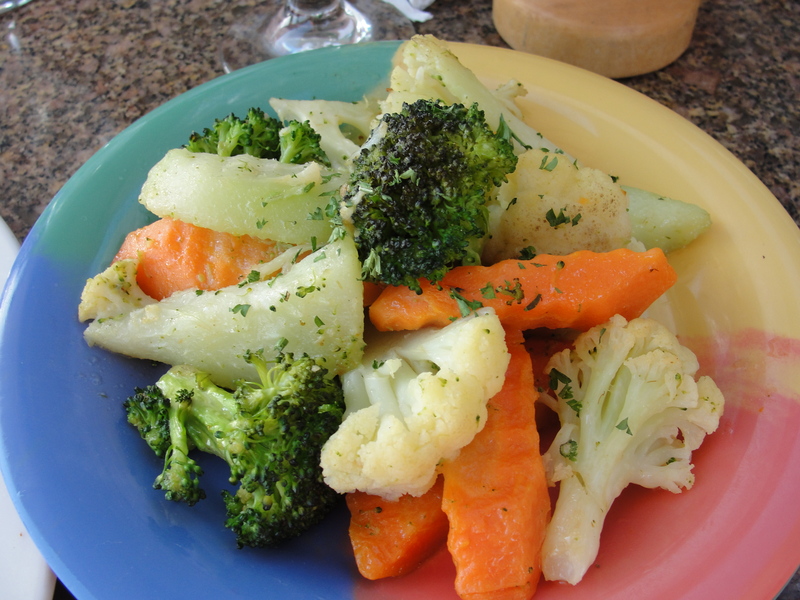 Next off, the veggies were good & simple. I would imagine that these veggies were frozen, as they lacked any true & natural color. They were a little bit overcooked for my liking but, that may be due to the fact that they were most likely frozen. As for flavor, there was some flavor but I did not feel as if any of these had an overpowering flavor. They were cooked with butter of some kind and it was almost as if the vegetables took on this flavor more than the actual vegetable taste. My first meal in the DR was good but not great. The shrimp were fine but nothing amazing. The veggies were pretty much the same. By far, this restaurant wins in views. It was awesome & relaxing sitting by the coast as the sun set. I will say do not sit under the trees. One of my coworkers was oh so unlucky to be hit by some bird dung before we ate. No bueno for sure. One meal down and trust me, so many more to come.